other’s homes for safety and liability reasons. out personal information about students to others. Tutors will be contacted every month by the Literacy of Northern NY staff and asked how many hours they tutored their student and what areas they are working on. It is very important that we receive this information in a timely manner. We are required by our funders to track tutoring hours and student accomplishments. We also meet every three months with each tutor/learner pair to update the learning plan, recommend materials, update goals, etc. Tutors and students should exchange phone numbers at their first meeting and agree to contact each other if one can’t attend a tutoring session. Tutors should issue a warning to students who continually miss appointments. If missed appointments are a frequent problem or if your student drops out of the program, please contact the office in a timely fashion. 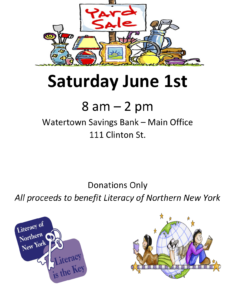 preparation time and travel time and report it on a timely basis to Literacy of Northern New York, Inc.
return this information to the LNNY office in a timely manner. I have been informed of Literacy of Northern New York’s safety policy which requires tutors and students to meet in public places that provide privacy for my student. I will also respect my student’s right to confidentiality.